I'm new to IntelliJ and trying to figure out how to develop a simple web app. I followed the ajax tutorial http://www.jetbrains.com/idea/training/demos/AJAX_demo.html. I thought that setup my Tomcat server already by adding a new configure and selected the location of my Tomcat 6 installation. But when I clicked the green arrow in the tool bar to deploy the app, nothing happened. My firefox browser didn't appear. I'm attaching my project also. 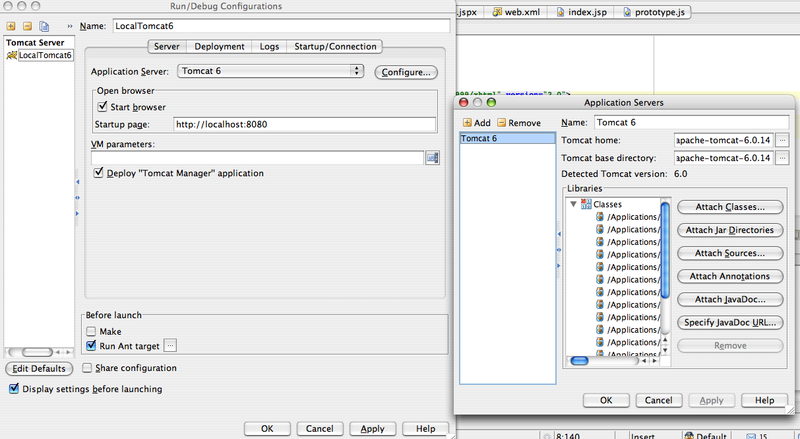 How can I debug this and how can I tell if I configured my Tomcat properly? I hope this is an easy for problem for IntelliJ experts. folder so they aren't accessible from browser. 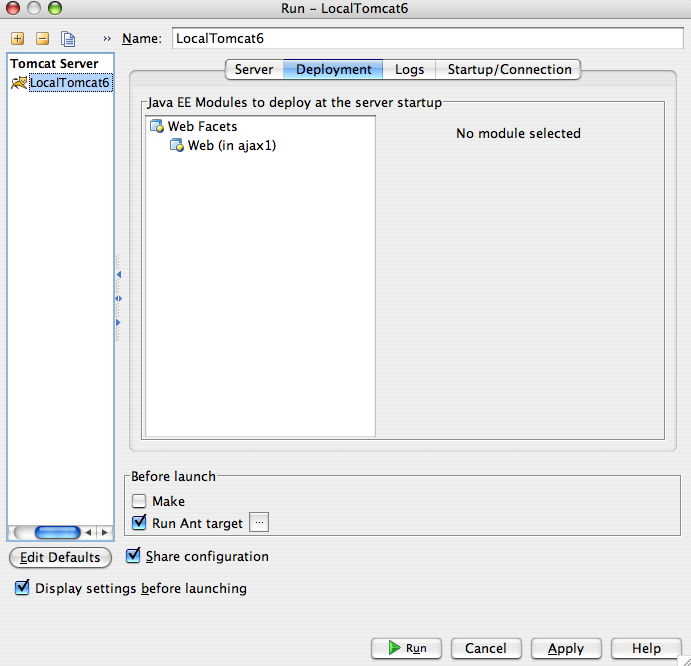 Do you know how I can share the same tomcat with different IntelliJ IDEA web projects? you cannot run two Tomcat instances simultaneously. That's what I want to do (e.g. 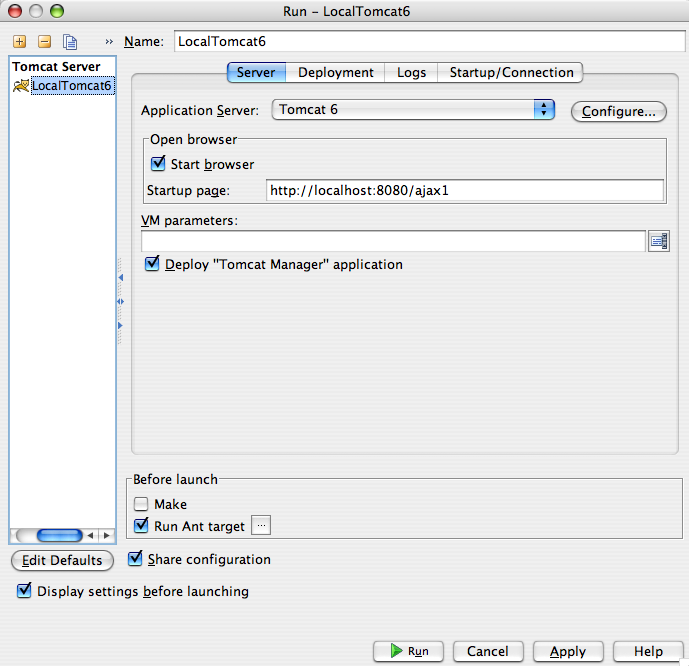 use the same Tomcat installation for different IDEA projects). But I kept getting the error (see attached) when I tried to run the 2nd project using the same Tomcat instance as my 1st IDEA project. What did I do wrong? Is Tomcat in first project terminated properly? Well, not really. I didn't stop / terminate Tomcat after I used it in my 1st project. When I stopped that, I was able to deploy my 2nd project to the same Tomcat (but I had to create a new configuration for this same Tomcat in my 2nd project though). Do you know if this how-to share same tomcat installation in different IDEA projects documented anywhere?